Hiking can put extra strain on the feet, because it may involve traveling long distances on foot in less-than comfortable footwear. You can help prevent foot blisters when hiking for a more enjoyable walk. Typical causes of blisters on the feet include friction and pressure from wearing the wrong kind or size of shoes, from damp socks or skin, and from intense activity. By taking steps to anticipate and counter these common problems, however, you can prevent painful blisters in the first place. Choose shoes that are the right size. Your shoes should be neither too tight nor too loose. A properly-fitting shoe will leave a half-inch of space between your longest toe (which is not necessarily your largest toe) and the tip of the shoe. Walk around in the shoes before buying them to ensure fit and comfort. A square or rounded “toe box” (the area of the shoe in which your toes go) will provide the best fit and greatest comfort. Try on shoes before you buy them, even if you know your size. This is because sizing may vary widely from brand to brand. Purchase shoes that fit well, even if the size is different from what you are used to wearing. Feet may swell up to eight percent in the course of the day, so shop for shoes in the afternoon, as that is the time of day when your feet will be enlarged. By choosing shoes that will fit comfortably even when your feet are at their largest, you will help to prevent blisters at all times. 2 Avoid footwear prone to causing blisters. Shoes that squeeze your foot, ones that are too loose, or ones that cause you to walk abnormally subject your foot to pressure and friction that may result in blisters. 3. Break your shoes in. Before wearing new shoes for prolonged periods of time, wear them for just short sessions. For instance, before wearing a new pair of shoes all day long, wear them for just a couple of hours at home. This process, known as breaking in your shoes, gives them time to gradually conform to your exact foot shape so that they will fit most comfortably. 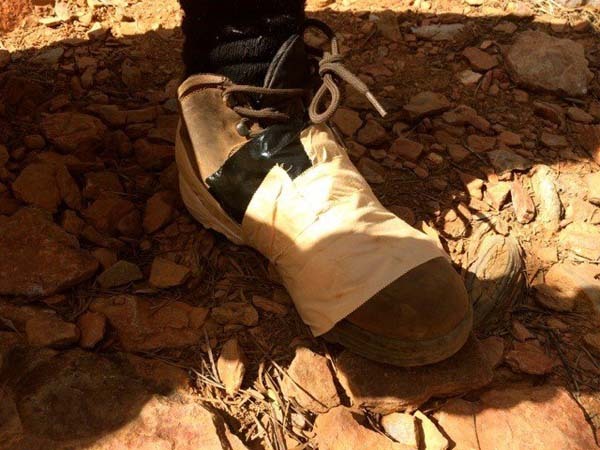 It is especially important hiking boots, are properly broken in before they are used normally for abour 4-6 weeks prior to your trip. 4. Choose the right socks. Cotton socks can absorb moisture; this can help control foot odor, but friction caused by the damp cloth also increases the risk of blisters. Instead, choose socks made of quick-drying synthetic fabrics or wool. Padded sports and hiking socks can be found at athletics and footwear stores. These can help prevent blisters. Wear two layers of socks. A thin sock made of a synthetic material will help to reduce friction. Wearing another sock made of a non-cotton, absorbent material such as wool will help to wick away moisture and keep your foot dry. 5. Use comfortable and supportive insoles. At footwear stores and many pharmacies, you will be able to find a variety of insoles that can be inserted in your shoe to provide more support, comfort, and a better overall fit. Make sure to purchase shoes with removable insoles so that you can replace them with more comfortable and/or supportive insoles as required. Replacement insoles may be made of neoprene (foam rubber), memory foam, gel-filled pads, and other materials. Evidence shows that neoprene insoles in particular can reduce the incidence of blisters. Insoles, especially orthopedic ones, may be available in various shapes designed to conform to different foot types. Try out different insoles until you find ones that fits your shoe and foot comfortably. 6. Keep your feet dry. Choose shoes made of material that is watertight but also breathable. This will keep moisture out, but also allow sweat to evaporate from your feet. Plastic and nylon shoes make it hard for your feet to ventilate. Choose footwear made of leather, canvas, mesh and other breathable materials. If your shoes or socks become wet, remove them as soon as possible. Let them dry before wearing them again. Dry your feet and put on fresh, dry socks and shoes. 1. Keep debris out of your socks and shoes. When foreign material like sand and twigs gets into your socks and/or shoes, it can increase friction as you walk and thus cause blisters. Properly-fitting footwear will help keep debris out. If you feel anything in your socks or shoes that shouldn’t be there, stop and remove it immediately. Keep a supply of lubricant with you in case you feel any blisters beginning to form during your hike. 3. Tape problem areas of your feet. By placing a small amount of adhesive material over areas of your feet that are prone to friction (known as “taping”), you can protect them and help prevent blisters from forming. Moleskin, available at pharmacies, is preferable to duct tape (which can lose its stickiness when it becomes wet). Cut a piece of moleskin slightly larger than the area susceptible to friction. Remove the backing from the moleskin to expose its adhesive surface. Press the moleskin to your foot, smoothing out any wrinkles from the center to edge. Put on your socks and footwear. 4.Toughen your skin by building endurance. If you increase the distance you walk, run, or hike by small amounts over time, the skin of your feet will become tougher. This can help to prevent blisters from forming.